There have been a lot of storms here the past week and so the pintos did not come up as often as usual. Several days ago they were here and I fed them carrots and alpha squares in the rain. Suddenly it began to hail and I was laughing and they were eating as fast as they could. They came up again this morning in the drizzle and I fed them. Several hours later I went out to photograph them for this blog and they obliged by lining up. Notice how big Suki is getting! He is now 6 months old. You will notice an overturned bench in the left hand corner - this is where I feed them. They often knock the bench over after being fed or if I am not around, they are disappointed that I have not been out to give them their treats. We hope to evenutally build a corral around this bench so we can start taking better care of them. First we have to be sure we can adopt them and then raise money to build the corral, fence the land, and have them seen by a vet. Monday, the pintos came up for carrots and alpha squares. When I call "Thunder" they all galloped to the bench where I feed them. What a beautiful sight to see them all run. Still haven't been able to capture a great running photo yet. Suki, the colt who is now now 5 months old, is a fast and graceful runner. 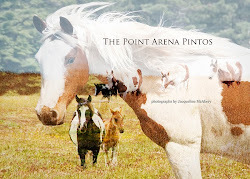 What made it a very special day is that all of the pintos, except for Thunder, let me stroke their backs. Even Sweetie, who is always skitterish and shutters when touched, but this time he held still a few seconds longer. I was delighted and blown away. We will see if I am able to stroke them again at their next visit. Even so, I am amazed at how they are progressing with human contact. 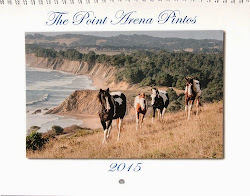 THE PINTOS AND I WISH YOU A HAPPY NEW YEAR!